We've all heard the axiom, "It's the thought that counts." As quilters, we also know that sometimes a deadline draws nigh and there's no way in you-know-where that a bed quilt is going to be quilted/bound/labeled in time to be gift-wrapped before that deadline. So, the next best thing is to give the "promise of a quilt"—the quilt top with an enclosed label. You quilters know that this is totally legit! "Parasol Blossoms" is going to a new home on Christmas this year. 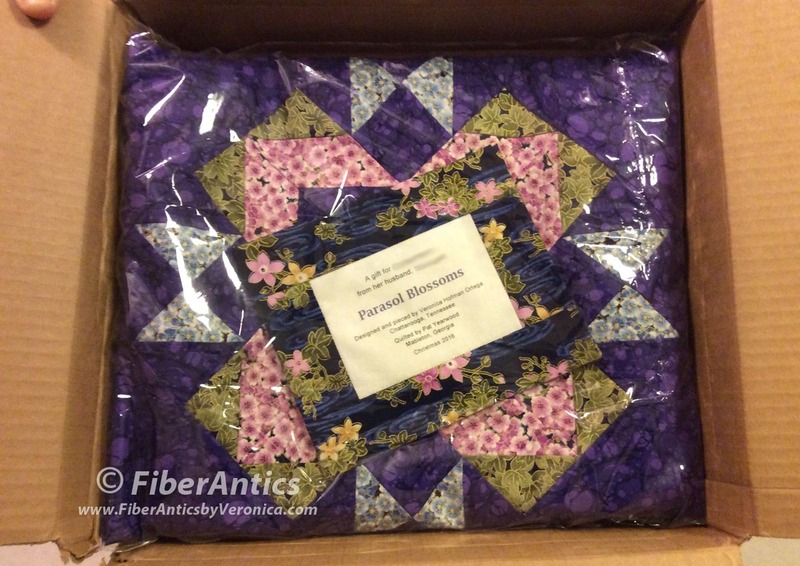 In this box is the "Parasol Blossoms" quilt top and a label. I designed and pieced the top and my friend and very accomplished long-arm quilter, Pat, from Stitch 'N Quilt, will be doing the quilting in the near future. My husband and I shipped the box off to its new home and someone in our family will be receiving this "promise" on December 25 as a gift from her spouse. I hope she likes it. The other axiom of which we're all familiar is, "Last-minute planning on your part doesn't necessarily mean RUSH on my part," (especially during the holiday season). So we do the best we can and send it with our wish for a Merry Christmas!